Many of my fellow believers are creationists, who hold that Genesis chapter one should be read as teaching a doctrine of how the world was scientifically made. While I respect the sincere faith of these believers, some are even in my church, I also see many Christians, myself included, encountering significant faith crises, because of the assumptions of that perspective. Many creationists see it as the opposite: that evolution will erode and destroy one’s faith. For me and many other Christ-followers, it simply hasn’t. For me, it is mostly because I found that Genesis one should not be made to comment on the scientific composition of the universe. Here is a reflection on why I think Genesis one is best understood as offering a theological narrative: timeless truths about God and creation delivered in a culturally bound way. There are some very good reasons not to take Genesis one as offering a scientific description of the creation of the world. Not doing so, I think, is the most consistent way to interpret it. This is because there are pre-modern notions about the cosmos that these text assumes. In fact, I will go so far as to say that if we do take it as a historical description of the material origins of us and the cosmos, if we make that the truth of this text, we force the text to contradict itself, reducing a literalistic strategy to absurdity. So, the following eight exegetical points attempt to point out the problems of a creationist approach. Because the text assumes a geo-centric cosmology, it cannot be used to support creationism which does not hold to these details. I am doing this without offering a full positive doctrine of creation (which is another argument that I will give later). However, trust me, I do think Genesis one is God’s Word and that the universe is God’s creation. But it is God’s Word in proper literary context, understanding the cultural climate it was written in. I believe in creation. I believe that Genesis one teaches us about creation. I just don’t believe in “creationism” as an idea that tries to extract science into this narrative or things all of the aspects of these narrative are applicable today. The opening verses describe the heavens and earth as “formless and void” yet the spirit of God hovers over the waters of the deep. Before everything else is created, there is water. Before there is time, planets, stars, there is water. That seems odd. Why is that? Is water the eternal, primal sub-atomic substance in which all things were constructed? Does this passage, as some suggest, contradict creation ex nihilo, the notion that God created the world out of nothing? No. Water was a symbol of nothingness. The Mediterranean Sea was thought to be an “abyss.” Why? If a sailor sank into the depths of the sea, they would disappear into what would seem like bottomless black nothingness, a void. Beginning with water is a metaphorical way of saying the world was “formless” and “void,” and so, God created the world out of nothing. Notice right off the bat then that choosing to see metaphor rather than concrete descriptions makes the images in the text make way more sense. It makes them much more meaningful. It has a better interpretive fit. Next we see that the creation of the earth precedes the creation of the very universe it is supposed to be situated in. This should tip us off that this is not a scientific description. In fact, we commit violence to the text by reading out modern assumptions into it. By all accounts the Sun is older than the earth, and the earth (as well as the moon) all formed because they were in orbit around the Sun. A creationist might retort and say that God held these things in place until the solar system was created, but then natural history is being portrayed as intentionally deceptive. However, the text does not say anything about such a process nor would it even be suggesting it as it is speaking to a non-scientific world. Often I find creationists doing these kinds of ad hoc interpretations in order to save their theology. What ends up happening is that creationist invent miracles that the text does not describe to make the simple narrative make sense by their interpretive assumptions. A good rule of thumb is that if you have to invent miracles in order for interpretations to make sense, you are probably reading into the text with the wrong approach. Light and darkness as well as night and day are placed before the sun and moon, by which light, time and day are generated and measured. Even the ancient people understood that light only comes from the sun and moon (remember, they did not have electricity). Yet the sun was often worshiped, so we see the sun’s importance relegated to a later day in creation. It is no longer the primary act of creation or its pinnacle. Light, the source of all the earth’s nourishment, the symbol of moral goodness, comes directly from God. Time and day, the forces that structure reality, again, are not controlled by a solar deity, but proceed directly from God. The sun, not even named, is demoted to merely being a sign for the seasons. The “seasons” are the times of the worship festivals. So, instead of being a god, it is merely a sign for the people of God to know when to worship the true God! Thus, we see that the creation days are most meaningful when we see them as a rhetorical strategy for countering pagan mythology. Blue Sky Made of Water? God divides the waters above to form the sky and the waters below to form the seas. The sky is described as being made out of water in the text. Again, I am amazed that creationists skip right over this. We know that the sky is not made out of water, but rather it is blue due to the fact that light rays going through the atmosphere show up blue, and the sea is blue because it reflects the blue of the sky. The sky is not blue because it is made of water. Again, this is a pre-modern description of the universe, not a scientific one. Sky is a Hard Dome? The sky is thought to be a hard “dome” (also translated “vault” or “expanse” or “firmament”). In the ancient cosmology the sky was made of water, separated by a dome-like wall. Creations oddly dismiss this detail, saying that it is no longer there because the waters came down in the flood. However, this neglects firstly that the dome is still around in Psalm 150:1 when the people of God are invited to praise him in this dome. The dome is a permanent fixture of the cosmos in the ancient mindset. Second, what is being described here is literally a hard dome, not a miraculously held up expanse of water. This dome has “flood gates” by which waters flood down (cf. Gen. 7:11). This dome is hard enough for God to “stretch out the heavens like a tent” over top and lay “the beams of his upper chambers on their waters” (Ps. 104:2-3). 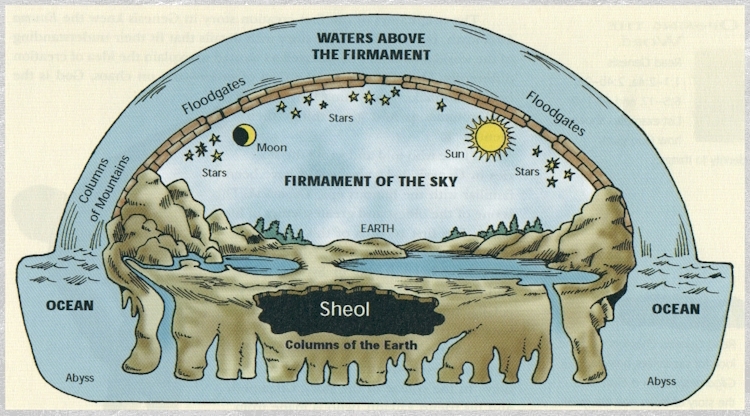 Isaiah 40:22 describes the heavens not like a spherical atmosphere, but as a “canopy” or “tent” on the flat earth. The flat earth rests on pillars. “When the earth totters, with all its inhabitants, it is I who keep its pillars steady” says God in Ps. 75:3. One cannot escape that the ancient people thought of the world like a building, with a dome over top and pillars below (cf. Ps. 104:5). For all their talk about reading the Bible plainly, creationist ironically read these passages as figurative. Expanding the last point, the sun and moon are described as embedded in this dome like lamps in a ceiling, “lights in the dome…God set them in the dome of the sky” (Gen. 1:1, 17). Experientially, we can look up and see that the sun and moon appear to be in front of the blue of the sky and it is no surprise that the ancient people literally thought this. They thought that the sun and moon were embedded in the dome of the sky, like lamps in a ceiling. The sun and moon are described as revolving around earth’s building, not the earth around the sun. Ecclesiastes poetically describes this: “The sun rises and the sun sets, and hurries back to where it rises” (Ecc. 1:8). A creationist might respond by saying these are merely a metaphor. To which, I would say that is an ironic strategy for defending an otherwise literalistic interpretation! In other words, that’s my point! Bracketing parts of the text as metaphor to preserve reading the rest of the passage as a scientific description is a sad, self-defeating strategy. Why not be consistent and read the whole description as pre-modern poetic description? That makes more sense. The fifth day mentions the creation of the great “sea monsters” (v. 21). This is often glossed as something less offensive to our modern ears, reading something like “sea creatures.” However the word in Hebrew is tannim, which literally means “dragons” or “monsters.” The Bible was written in a time when people assumed these things existed. For instance the Book of Job reports the Leviathan and Behemoth as massive mythological forces of evil and chaos, but assumes they are real: “as I made you [Job] I made it [Behemoth]” (Job 40: 15). Isaiah 27:1 refers to Leviathan as the “dragon of the Sea.” Psalm 74:14 mentions that Leviathan has many heads like a hydra. Creationists have tried to say that these refer to the dinosaurs before the flood. Dinosaurs certainly do resemble dragons, but these passages refer to these beasts as presently existing at the time of writing, well after the time that the flood supposedly wiped out the dinosaurs. The Bible also mentions creatures like Rahab (Job 9:13; also called Lilith, cf. Isa. 34:13), not to be confused by the prostitute that helped the spies in Canaan. Rahab is described as a dragon-like enemy of God that God defeats: “Was it not you who cut Rahab in pieces, who pierced the dragon?” (Isa. 51:9). Rabbinic commentators describe her as a vampire-like woman. Job 26:12 describes God striker her down like he rebukes the Sea, the Sea (capital “S”) being a symbol for cosmic forces of chaos and nothingness in Job. Similarly, Psalm 89:9-10 refers to God conquering the chaos of the Sea, slaying Rahab and the enemies of God, Rahab being a kind of symbol for chaos and evil. Why does the Bible include this stuff? It is because the ancient people thought they were real and the Bible is trying to comfort them by entering their cultural standpoint, assuring that God is more powerful than any evil they can imagine. What is more comforting? If the Bible said, “Those things don’t exist, silly” or “Whatever evil you can imagine, God is greater than that.” The Bible tends to choose the later strategy. Different Creation Order from Genesis Two? Notice in comparison to Genesis two that Genesis one reports the order and events of creation differently. Thus, if they are read as strictly historical accounts rather than literary-theological accounts, they are contradictory. It seems like Israel has two creation accounts that were quite different that the writer of Genesis knowingly put next to each other because both story’s teachings are true. They are both inspired stories. First, while in chapter one creation occurred in a week-long process, in chapter two it is in a day: “In the day that the Lord God made the earth and the heavens” (2:4). Now, “in the day” can mean a period of time, but in this context it does not seem to. This refers to Genesis two, where, as we will see, a new creation story is being presented, which does not use a creation week. Its events are presented undifferentiated by days. Thus, it seems that “day” could mean a week-long period, there are no creation days in Genesis two for it to correspond to. Second, there is a different creation mode. Genesis one creates by divine word alone. Genesis two uses the imagery of a fountain (perhaps the river of life alluded to Rev. 22:1-2) springing forth and covering the earth (decidedly different from water being the beginning substance that is pushed back in chapter one). From there, God “formed out the ground” man, plants, animals, and birds. Chapter two describes creation not by word instantaneously but like a potter forming clay, then breathing life into it. In Genesis one God is a poet; in Genesis two, God is an artisan. Third, there is a different order to the two creation stories. In chapter one, the order of creation goes birds and fish on day five, then on day six animals first and then male and female created simultaneously that same day. Day five: birds fish; day six: animals then humans, male and female. In chapter two the order goes as follows: the man, then vegetation comes up (v. 9 – where it is already made in the first account), then animals and birds are formed (v. 19), then the woman from Adam’s rib. It is an often neglected detail that in the second creation account God creates the man first, and it is only after he states that it is not good for the man to be alone that he then creates animals and birds, who are not suited for him, and only after that realization, the woman is formed. Verse 19 sees the creation of every animal as a consequent act to realize Adam is alone: “So then out of the ground the Lord God formed every animal of the field and every bird of the air…” Creationists inject alternative meanings to say that God had already made the animals and birds, but the passage describes a subsequent and consecutive event. In fact, it is similar to most verses in this chapter that begins with what is called a waw consecutive (the Hebrew word for “and then”), which is the engine of Hebrew narrative (literally every sentence in a narrative will begin with a waw, “and then,” but most translations edit them out). Again, if you read them as historical accounts, you force the passages to contradict themselves. If you try to use the passage to support creationism, you are glossing over a lot of details to make it work. If you read them like they intend to be read, as theological narratives, something closer to a parable, then you will have no problem seeing these different orders as incidental to the enduring theological truth of the passage. What should we do with this? Is Genesis a Myth? Is Genesis a myth or is it history? The Bible never uses the term myth to describes its contents. In fact 2 Peter 1:16 is quite condemning of the category. So, many are troubled to hear that the creation myths around and before Israel had similarities to Genesis one. In Genesis chapter one, we see what can best be described as an “inspired story” or a “counter-myth.” This is a story that resembles myths that proceeded it, told using the form of story that ancient people used to explain their world, but uses that medium to present truth that counters pagan ways of thinking about God. Is it purely fictional then? Didn’t ancient Israelites think it was factually true? Creationists are right to think that the writer of Genesis one probably did think the universe was created in six 24 hour periods 6000 years ago. However, it assumes the geo-centric cosmology of culture as well. The text does assume a cultural history that the ancient people assumed, but is crafted through the covenant relationship with God to present us with redemptive truths that speak beyond the ancient assumptions. The idea that Genesis one has pre-modern qualities or assumes a history that we do not hold to today, does not disprove its enduring theological worth. Far from, it shows its incarnational beauty. God worked from within the ancient culture. We as responsible interpreters need to be discerning about what is cultural and what is timeless. We do this by discerning the context of the text in its historical context and as it has been reflected upon by Christians for 2000 years. Are we condemned to disbelief about God as a creator, creating the world out of nothing because of these prescientific descriptions? No. It should be no scandal that God used people where they were at to communicate his Word. The notion that God was trying to teach physics and astronomy to a pre-scientific people implies that that Bible is true because it is a science text book and not a book about a God that comes into our world. In fact, people who want to read the Bible as offering a culture-less statement of timeless principles often have a very docetic view: a Word from God without human flesh. It makes way more sense that, just as Jesus stepped into human (Jewish!) flesh, God stepped into a world that thought in terms of story to offer redemptive truth using the media of the culture. Just as Jesus assumes that the mustard seed is the smallest seed (which was the ancient assumption) to teach as about the power of faith, so also Genesis assumes a geocentric universe to communicate God. The meaning of faith is not damaged by the mustard seed not actually being the smallest seed nor is creation disproved by astronomy. So, the fact that God used ancient means of communicating theology should not bother us. In fact, it is a comfort: God uses imperfect authors to write his perfect Word just as he uses us imperfect people to be his Body. He uses our cultural thoughts to communicate his perfect thoughts. This passage is offered in the form or medium of a nonscientific counter-myth or origin story (which is how the ancient people thought), yet its enduring message or substance is that God is creator and nothing else is, the creation is good, life-giving ordered, and beautiful, and humans are made in God’s image, designed to inherent dignity and to find themselves in his love, etc. What we have to keep in mind is that God has communicated something enduring in something culturally-bound. This is called the form/substance distinction that Baptist interpreters (such as E. Y. Mullins and Walter Connor) have suggested for over a century. Does the Bible assume a hard domed universe? Yes. Does it assume a 6000 year old cosmos? Yes. Does it assume a geo-centric universe? Yes. Does it assume the existence of dragons? Yes. Does the Bible implore us to believe these things now in order to believe God is a creator? No. Those things are incidental. God is creator of all that exists, creates out of nothing, and therefore, is greater than all the forces of chaos in our world. God is beyond creation, and so, nothing in creation is to be treated as god, and therefore, humans ought not to be enslaved to the worship of finite things. Creation is made by divine decree, and therefore is ordered, good and life-giving. Creation is designed for peace, worship and Sabbath. All humans, not just kings, high priests, or warlords but all people, male and female, rich and poor, are made in God’s image, deserving the dignity and rights God’s children deserve. All humans are designed to act like God, emulating his “likeness” of goodness and love. People have a responsibility to be stewards of the environment, not to destroy it or waste the precious gift we have been given, but to care for it. Reading Scripture through the entire canon, we know that Genesis one is true because it points to Christ. Christ is the logos of God, bringing creation into being (John 1). Christ is the truth of creation, and the truth of creation points forward not backward: Christ is the light shining in the darkness and is ushering a new creation in our midst. The power of Genesis one has not merely happened but is happening as we look to the transformation that Gospel is enacting. All of that is still true and simply does not depend on whether a creation event happened six thousand years ago. There are, of course, more truths in the text, and these can be discerned with wisdom, in the community of the faithful, gathered to listen to how the Spirit will use the Scriptures to speak to us. You can hold to evolution and that universe is billions of years old and that Genesis is God’s Word. Why? For the same reason we trust the Gospel today: God has meet us where we are at. Love this. I will link to it from the show notes of one of my upcoming podcasts on Genesis 1.